The Canucks boast some of the best forwards in the league. The wonder twins (Daniel and Henrik Sedin) are near unstoppable together, along with Ryan Kesler down on the second line making things difficult for the opposing team’s star player. Kesler can also get points, making him nearly invaluable. He held Jonathan Toews scoreless until Game 7 of the quarterfinals and he put up an astounding 11 points in the semifinals against Nashville (5 goals, 6 assists). He’ll probably be the Conn Smythe winner when it’s all said and done. On the other end, does a starting line with Nathan Horton, David Krejci and Milan Lucic scare you? Hardly. These three are solid players, but I doubt they’ll do any significant damage against Vancouver’s defense. Boston’s second line of Brad Marchand, Patrice Bergeron and Mark Recchi is going to be key. They’re hard workers and will cause some trouble for Vancouver if they don’t hustle hard enough. If rookie Tyler Seguin can come back and make an impact like he did in his first two playoff games, the Bruins might be able to squeeze a few victories and make it an interesting series. However, Seguin is pointless in his last five games, and it’ll be tough for the 19 year-old to rebound. Beside’s Boston’s first pairing of Dennis Seidenberg and the giant six-foot-nine Zdeno Chara, the Bruins are in a bit of trouble. Tomas Kaberle has been a liability this postseason, and nobody else has done anything noteworthy. The Canucks have about as much depth on the blue line as anybody, so the advantage goes to them easily. 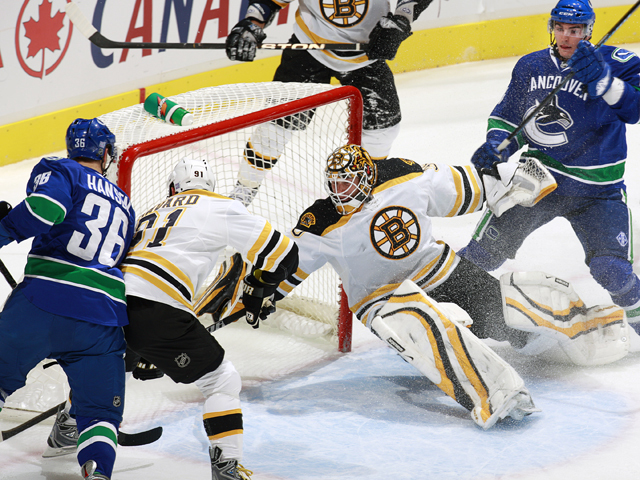 Both the Bruins’ Tim Thomas and the Canucks’ Roberto Luongo have been shaky this postseason. Luongo nearly gave up a 3-0 series lead against the Blackhawks but has since rebounded. Thomas struggled against the Tampa Bay Lighting, giving up a total of 10 goals in their two losses. Thomas will have his hands full once again going against Vancouver’s potent offense. Luongo seems to have the easier path to victory. The Bruins penalty kill has been decent (80.6 percent success-rate), but their power play has been downright terrible (8.2 percent success-rate). Vancouver was one of the best two-way teams in the regular season, attaining the league’s best power play (24.3 percent) and a top three penalty kill (85.6 percent). The Canucks kept their power play strong while their kill has taken a bit of a leap down. Boston’s power play may be the deciding factor in this series, because their kill likely won’t hold up against the onslaught the Canucks will bring. Vancouver is the clear favorite in this series. Boston may be able to sneak a few wins here and there but Vancouver should have no problem dominating them on the offensive and defensive ends. Kesler has been downright nasty in the 2011 postseason. His defense on Jonathan Toews and his offense against Nashville should be enough to get him the trophy alone. He’ll continue his fine-tuned play against Boston as well.